White German Shepherd Dogs and Puppies have an interesting and unique history in the origins of the German Shepherd dog breed. 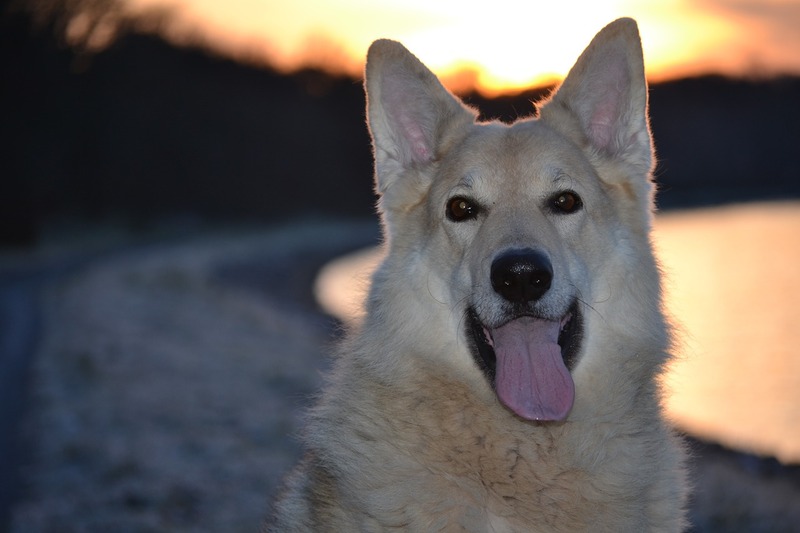 From being accused of being Albino and almost being run out of some countries in the past, this color of German Shepherd now holds a more popular place in modern society. We’ve put together 18 essential and interesting facts, and commonly asked questions about the White German Shepherd. This guide will be useful whether you are an owner, looking to buy or just interested in this variation of the German Shepherd. 1) What Breed is a White German Shepherd/Alsatian Dog? White German Shepherds, like their Black German Shepherd counterparts, are recognized as an official color of the German Shepherd breed by the American Kennel Club. White is one of the 11 accepted coat colours that deviate from the traditional and breed standard black and tan coloring. 2) What Is The History of the White German Shepherd? White German Shepherd dogs have an interesting part in German Shepherd breeding history. A white herding dog call “Greif” was the grandfather of the original German Shepherd, Horand von Grafath. Max von Stephanitz (the man credited with creating the German Shepherd) based his breeding program around Horand von Grafath. Because of Greif, it was possible for the recessive white gene to be passed down in the DNA material of German Shepherds, and White German Shepherds to exist. White German Shepherds should not be confused with White Shepherds, which are a different breed altogether. White Shepherds have similar origins to Whie Swiss Shepherds which we will talk about later in this article. 3) Why Are Some German Shepherds White, All White, Pure White, Snow White, Albino or Cream in Color? When people refer to any of the above names or terms (except albinos – white GSds are not albinos), they are referring to a GSD that is white in appearance, or as some people call it, a polar bear German Shepherd. The Daily Shep wrote about how different GSDs with different color and patterns/marking combinations are created in our article about Black German Shepherds. A White GSD puppy is born when double recessive white color genes are passed down from the parents to the puppy. When both parents are white, the puppy will be white, but the parents can be different colors as long as one has the recessive white gene. Whether the puppy is solid white depends on if the parents also pass the solid white pattern gene to the White German Shepherd Puppy. While white GSDs can be all white, some have patterns or marking distributions which cause them to be predominantly white, and black in some parts like the back/saddle for example. Silver and white German Shepherds, and tan/black and white German Shepherds are other more common white variations. 4) What Is The Life Expectancy of A White German Shepherd? German Shepherds are medium to large dogs that have a lifespan on average up to 13 years old. 5) Can You Get White Long Haired German Shepherds, or Are They Only Short Haired? Yes, Long haired White German Shepherd dogs do exist. Long Haired White German Shepherds will be born when the long hair recessive gene is passed on in the DNA, along with the white color recessive gene. There seems to be some confusion over the behavior and temperament of this color of GSD. Some sources have claimed some independent (but not verified) data has emerged which suggests White German Shepherds are slightly more placid and don’t have as much of a drive or edge as their black and tan counterparts. Other sources say the White German Shepherd in particular can turn on its owner or attack strangers. There is no scientific data supporting any of these notions that we could find. As with other German Shepherds, the White German Shepherd is an intelligent dog. It is not readily trusting of strangers though very loyal to its family. When given early socialisation and obedience training, they will give their owners and other people few issues, especially on the aggression side of things. Ultimately, as we have said before, GSD behavior and temperament is best predicted by tracing the lines of the parents and ancestor of the dog in question. DNA has a huge part to do with it. It should be noted White German Shepherds are NOT albinos, and do not have any of the health problems associated with albinism. White German Shepherds suffer from the same health problems plaguing all GSDs. Daily Shep has reported before that Hip and Joint Dysplasia is the primary health concern for GSDs, and joint supplements may come into consideration (which we also wrote about). Being medium to large dogs, obesity can be a health problem for White German Shepherds, particularly as they age. Calorie intake should be monitored closely along with your white German Shepherd’s weight. 8) When Do White German Shepherds Stop Growing? We spoke about German Shepherd puppy and adult growth rates at DailyShep.com in ‘How Big Will My German Shepherd Get’. A GSD puppy will usually double its birth weight in the first week. When you get a GSD puppy at the standard age of 8 weeks or 2 months old, your puppy will be around 16-19 lb (7.5-9 kg). A GSD will increase in size 5-10% monthly up until the age of about 1 year or 12 months. At this age, your GSD’s growth rate will slow rapidly until the age of about 18 to 24 months old when they reach physical maturity. Eastern German Shepherd lines reach maturity later. Adult or full grown White German Shepherd dogs will end up around 70 times the size of its original birth height and weight. Males average 60-65 cms (24-26 in), and 30-40 kg (66-88 lb). Females average 55-60 cms (22-24 in), and 22-32 kg (49-71 lb). You can check out a German Shepherd Growth Chart (input your breed and other details first). 9) White German Shepherd Conformance and Standard – Why are White GSDs Disqualified, or Controversial in Showing? So, White German Shepherds can enter American shows, but it is the breed standard written by the club that disqualifies them immediately. 10) How much does a White German Shepherd Puppy Cost? On average, you might pay anywhere from $500 to $1500 for a pet, or family dog type White German Shepherd from a breeder. For White German Shepherds with pedigrees, papers, working titles, specific lines, and puppies who have a proven regulated breeding history – you can pay thousands of dollars. When adopting a White German Shepherd, you might pay anywhere from $50 to $500 – which covers adoption fees. A cool fact is that some White German Shepherd Puppies are born with blue eyes. But, there is some debate over what causes it – mutation or extremely rare genes. Petmd.com have a list of the most popular male and female German Shepherd names which are sorted by gender and first letter. 14) White German Shepherd Mix Breeds – Wolf, Husky and Labrador! Solid White German Shepherd Wolf mixes are extremely rare when talking about color. Also known as a Wolfdog, these mixes are usually born white/grey with a dark saddle/back, or a mix of white, black and grey all over. Any breed mixed with a Wolf is usually very independent and maintains a lot of the pack animal instincts of the wolf whose genes are very dominant. These mixes can be unpredictable in temperament, need a strong owner, and lots of training and obedience. Wolfdogs are not legal in some countries and jurisdictions so check your local area dog regulations. Also known as the Gerberian Shepsky or German Husky. A large dog that is extremely intelligent and obedient. They have an exotic look mainly due to the German Shepherd’s sleek body and the Husky’s piercing eyes. Both breeds were bred as working dogs so this mix will need plenty of regular exercise. You can view a photo of the White German Shepherd Mix Husky at dogs.petbreeds.com. The White German Shepherd Lab Mix is also know as the Sheprador or Labrashepherd. They are a medium to large dog that combine the friendly nature of the Labrador and the cautious nature of the German Shepherd. The White German Shepherd Labrador mix is just at home being a family dog as it is performing working dog tasks. Dogs.petbreeds.com has a photo of a White Sheprador/Labrashepherd you can view. The White Swiss Shepherd Dog (also known as the Berger Blanc Suisse, Weisser Schweizer Schäferhund) is technically a different breed to the White German Shepherd dog. Ironically enough, their origins begin from the Greif (Horand von Grafath’s grandfather), who was mentioned above, and the original German Shepherd breeding program started by Max von Stephanitz. They were originally bred from the German Shepherd line, but in 1959, Germany began culling White German Shepherds from the German Shepherd breeding lines because they saw these dogs as Albinos (which they aren’t). In 1967, Swiss woman Agatha Burch returned to her homeland, and bred her American White German Shepherd, Lobo, with a White German Shepherd she imported from the UK. As mentioned by WhiteShepherd.org.au, this is where the White Swiss Shepherd’s origins truly begin. The main area difference apart from their appearance between these two breeds is in their temperament. Whilst German Shepherds are by nature friendly, but sometimes wary and not easy to gain their trust, Swiss Shepherds are extremely social and thrive on human interaction, affection and play. German Shepherds are probably more versatile in this regard, but both breeds make excellent pets and companions. It is rare to see White German Shepherds doing aggressive police dog and guard dog work. The reason for this is the lines they were bred from. White German Shepherds were bred mainly from the show lines which were of course showing dogs, and performed work such as herding and tracking. The East German DDR German Shepherd working lines are more so the lines that were bred for police and guard work, and they maintain a primarily black coat. You can find some great photos of White German Shepherds on the White German Shepherds Facebook page. We are in no way connected to this page.